Spoil Yourself – Whether you have had a very good year or maybe an iffy (not so good) year, now is the time to give yourself a bit of TLC. Buy the car you want, nor one that just does its job! Let your heart do the buying. We have put together a collection of vehicles that are not only highly desirable but also practical and value for money so that you can spoil yourself and feel good about it. Cars to die for – You only live once. Instead of getting the same old, same old, go for something different. The choice in the market is amazing. Mazda6 – Family car – This is the car that inherits the place the Valiant, Ford Granada and Chev 4100 used to occupy. Safe, comfortable, spacious family motoring and affordable compared to the competition. The Mazda 6 ticks all the right boxes and for R314 040 you get a lot of car. It’s the same price as the entry level BMW 320 but is the size of a 5 series. Pleasing on the eye and pocket. The 2.5 litre engine puts out 125kW which is almost sporty. Kia Sorento – Medium SUV – Space with a go anywhere attitude, luxury, performance, and value for money. This car fits in everywhere, brutal in a way, but at the same time elegant. A bit like a Range Rover on a budget. The 2.2 litre 4×4 auto costs R375 995 and comes standard with everything, even a reverse camera which displays in the mirror and park assist. It has loads of little extras which will make you feel special. A superb fully equipped cabin with for example courtesy lights in the doors. Lots of space in the back and the seats fold down. Subaru Legacy – Sport saloon – Pace and space at a very good price considering the capability and quality of this vehicle. You get twice the car compared to its German competition. We drove the ‘normal’ 2.0i Premium at R299 000 and the very hot turbo intercooled 2.5i GT at R439 000 pushing out 195kW and 350Nm. In comparison the Audi A6 2.0 TFSI costs R412 105 and the 2.8 FSI R509 220. These cars come with a host of luxury items as standard. These include a sunroof, keyless entry, dual climate control, electric seats with two memories and all the electronic driver aids. I found that the normal 2.0i had more than enough power and it feels good to drive. You only buy the GT if you have a real need for speed. VW Jetta – Compact car – The car with the boot and a very good cabin. A classy compact sedan with great engines and stylish design. It is smart, is a pleasure to drive and is compact but has a feeling of space. The 1.4 TSI Comfortline DSG which we tested costs R257 680, which is not exactly cheap. Do not be put off by the size of the engine, the turbo more than makes up for its diminutive capacity but retains the good consumption of a smaller block. Nissan Qashqai – Crossover – The car for you if you want to be a little different, comfortable and enjoy superior hassle free motoring. I loved this car, especially its driving position. You feel like the king of the road. The overall impression is of smoothness, grace and style. We drove the 2.0 Accenta at R289 300. It handles well on all roads and in all conditions. Excellent consumption and performance with good interior space. Superior motoring in an unassuming package. Citroën DS 3 – Sub compact – The DS 3 is chic, has oodles of flair and is fun to drive. A direct competitor of the Mini, but a much better buy at R200 268 for the base model 1.6 VTi Style. I was disappointed in the normal C3, but the DS 3 is a revelation. You can’t help but smile while driving this little beauty. It is sweet, in the sense that Citroën have got it right, you just gotta love it. Perhaps not the most practical car out there, but who cares. Its zippy, its fun, its DS 3. In a nutshell, with all these cars you can drive a car that is a little different, offers something more than the rest and not pay more than you perhaps would have. Have fun. Originally published in Your Business in December. Bonnie and Clyde would have loved one. Any Chicago gangster or mafioso would have loved to be seen alive in one. Its the Materia, a small van like car which looks a bit like a gangster car of old. The Materia is a tall boxlike design with a high roof line and a high window line. The head space is amazing. Even Marge Simpson could sit in a Matera and not ruffle a hair. The other spectacular dimension is the space between the front seats and the back. The doors open to nearly 90° making for easy access and ease of use. No wonder so many taxis are Materias these days. The excellent handling in city conditions, due partly to a very tight turning circle, the exceptional interior space and very good fuel economy make it a good taxi. The interior dimensions create a sense of interior space. The rear seats which have a a 60/40 split, fold completely flat and because there is no the boot lip you get a flat loading space like a normal van. There are a number of little storage spaces between the ‘boot floor’ and the spare wheel. The Materia makes an excellent ‘micro’ delivery van. Bonnie and Clyde could have stashed the loot from two banks in the back with the rear seat down. They could also have kept real cool. The air-conditioner works really well and has an intelligent function that switches it off and on several times per second when there is severe load on the engine and to ensure optimal fuel consumption. Radio, MP3 and CD player is a little complicated at first but boasts a 6 speaker system incorporates split tweeter system / midrange at the front. Other standard features include 8 cup holders, central locking with immobiliser which continually changes its code, ABS brakes with EBD and brake assist, driver, passenger and side airbags, air-conditioning, alloy wheels, electric windows and mirrors, electrically assisted power steering, fog lamps and high-mount rear stop lamp. Some aspects of the interior design are a little quirky and the ergonomics can be described as a bit dodgy. The instrument cluster is mounted high atop the facia and is far out of the drivers normal field of view. The gear changes are quite klunky and noisy, but one soon gets used to it. It is a great city car due to its short gearing, light steering and tight turning circle which are well suited to city maneouvering. The 1498cc DOHC engine with DVVT produces 77 kw of power output at 6 000 rpm and 132 Nm of torque at 4 400 at rpm is more than sufficient for urban use. Fuel consumption is 7.2 litre/100km on the open road and 7.5 litre per 100 km in the combined cycle. It’s looks take a bit of getting used to, but once you start driving it the fun nature comes out and you start to enjoy the Materia. Originally published in Your Business magazine in January 2010. ‘It’s a new cost-saving option for the light transport and delivery business’ according to Nissan. When we reviewed the then new NP200 replacement for the venerable Nissan 1400 ‘Champ’ bakkie last year we said the range needs a diesel. Nissan added the 1.5dCi common rail turbodiesel model late last year and we tested it recently. In a nutshell, I think it will become the new ‘champ’ of smaller bakkies for business owners. It is a real pleasure to drive with more than enough torque and power to haul the 800kg that it can carry. Nissan quotes power output of63kW at 3750rpm and 200Nm of torque at 1900rpm with a diesel consumption of 5.3l/100km in the EU combined test cycle. The NP200 dCi is available the base specification level: steel rims, plain black bumpers and sills. It does get driver and passenger crash bags, a rubberised load box and an anti-intrusion bar. Radio is an optional extra. The High spec version which we drove gets anti-lock brakes with electronic brake pressure distribution, body-colour bumpers and sills, 15″ alloys, a height-adjustable driver’s seat with lumbar support, air-conditioning and a radio/CD player. There is good space behind the seats which are comfortable and seem well put together. The gearbox is a bit mushy and not quite precise at first, but one soon gets used to it. Driving it then becomes a pleasure. It’s not exactly cheap, but because its actually a ¾ ton bakkie able to carry 800 kg, has a larger loadbay than the true ½ ton bakkies and enjoys a much roomier cabin you should perhaps factor in the added versatity. As a comparison Nissan’s own one ton NP300 2,5 Tdi costs R177 000 but uses more fuel of course. The cheapest ½ ton diesel is the Ford 1,4 TDCi at R141 250, but it must be said it carries less and has 40 Nm less torque. The cheapest NP200 is the 1,6 8 valve petrol model at R104 900. It boils down to choosing between petrol and diesel and the price difference of over R30 000. Prices are R143 600 for the 1.5dCi Base model – and the fully equiped model,the 1.5dCi High is R174 000. Service plan is an extra R11 058. Following the trend started by VW of launching a new model but keeping the previous model as a cheaper version, Ford have developed the Figo from the old Fiesta Mk4. It is a whole new development of the car and is built by Ford of India which has helped to keep costs down but keep quality up. The bigger lights and the added crease line which runs around the back give the Figo a cheekier more upfront look which should remain fresh for many years. There are three models and two trim levels at present. The basic trim is called Ambiente and includes dual airbags, airconditioner, radio/CD with aux jack, power steering, ABS (anti skid brakes) with EBD (electronic brake distribution) and key operated central locking. The Trend model (only available in petrol) adds alloy wheels, electric windows, remote central locking, front fog lamps and height adjustable driver’s seat. Very neat. The Figo comes so comprehensively equipped with the Trend model that you do not have to spend on extras. The price you see is the price you pay. You get to choose between the 1.4 Duratec petrol engine which produces 62kW at 6 000rpm and 127Nm at 4 000rpm and a claimed fuel consumption of 6.6 litres per 100km or the 1.4 TDCi diesel with 51kW at 4 000rpm and 160Nm at 4 000rpm with a predicted fuel consumption around 5.3 litres per 100km. There is no automatic transmission. The manual box is slick and smooth. It’s a pleasure to use. The Figo is fun to drive. I tested the 1.4 Trend petrol model and was impressed with the willingness and smoothness. Road holding and handling is, as with all modern Fords, excellent. It handles and feels like a bigger car. The steering is very light and direct. I found the lights to be really good, especially the fog lights. The car feels spacious for a compact model with generous leg, shoulder and head room. The steering is height adjustable. The interior is easy to live with except the rather garish bright silver paint on the centre console, the rather flimsy feeling door handles and the trim around the air vents. Visibility is good. The seats are very comfortable and look and feel good. The controls all work well and are easy to use. The boot is opened either from the key or a button on the dash. It’s not too small and has no protruding bits which in some cars leave you with little usable space. The seats fold forward to provide a lot of packing space. Pricing of the Figo is as follows 1.4 Ambiente R114 980 (+R3 078 CO2 tax), 1.4 TDCi R126 630 (+R1 625 CO2 tax) 1.4 Trend R130 080 (+R3 078 CO2 tax). Figo comes with a 4 year or 120 000km warranty and 3 year roadside assistance. The corrosion warranty is 5 years. I predict that the Figo is going to become a big seller for Ford. Already there is a two month waiting list for some models. Originally published in Your Business magazine September 2010. Originally published in Your Business magazine in December 2010. Getting the right wheels for your business is not such a simple decision. A few years ago it was simple. Which bakkie to get? And there were only four possibilities. But times have changed. Not only must we now consider the purchase price, but the cost of ownership over the life of the vehicle which includes the cost of fuel and the type of fuel and the overall efficiency needs to be considered. We also need to think about security, image and driver comfort and behaviour. A base petrol bakkie with a basic canopy will cost you around R115 00, while a base model petrol van will cost around R 150 000. So what do you get for the extra R35 000? For starters the specifications of the vans are more in line with the middle trim, if not top model of the bakkies. This includes little but important details like a place to keep your clip board, much better seats and so on. If you compare bakkies with vans of a similar specification then the price difference is about R10 000. Secondly you get much easier access to your load. Remember the vans have a door on the side as well as fully opening doors at the back. The load bed is normally lower. At around 800 kg payload capacity the vans can carry more than the bakkies, except for the Nissan. Thirdly and probably most importantly security is in another league entirely. The vans are safer to drive and your cargo is safer in the back. Finally the cabs of the vans are as a rule better designed for a delivery vehicle and more ergonomic. If you need to keep your load cool you need to get a van with air conditioner like the Doblo. With the diesels it looks a little different, but the difference is also around R30 000. If you compare the diesel vans and bakkies of the same trim levels the difference is around R5 000. Fuel consumption is generally better for the vans. There are broadly five makes available on the market. The smallest is the Chevrolet which used to be the Opel Corsa and the biggest the Nissan NP200. Generally speaking you will need to add the cost of a canopy to the price of you bakkie. The most basic canopy from Canopy King is R5 200. Beekmans have a slightly more robust canopy which has a high roofline and full door at R6 600. The biggest selling small bakkie in recent years has been the Opel Corsa. In May it was facelifted, become slightly more expensive and is now badged as a Chevrolet. It is a great little all rounder but has rather limited carrying capacity. The Ford Bantam has also recently had a mid-life upgrade. It’s a great little bakkie and handles extremely well. The diesel engine is very smooth and effective. The Nissan NP200 is the biggest of these bakkies concerning both the cabin space and the carrying capacity. Its also the newest design and shares a platform with the Renault Sandero. The Fiat Strada has an ace up its sleeve in the form of the X-space an extended cab version. These Fiats are extremely economical. The Proton Arena is made in Malaysia and offers a three year warranty. Five manufacturers offer small vans. The best selling is the VW Caddy, the most versatile and the biggest is the FIAT Doblo. The Toyota is basically the MPV without the seats and windows. The Toyota Avanza is not quite in the same league as the others. 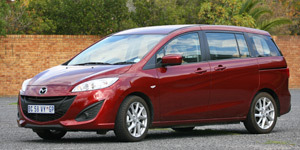 It is more of a replacement for the previous Corolla Tazz micro van. If all you want is a very small delivery van then it’s quite a cost effective solution. I drove one in Johannesburg and can confirm that it is powerful enough to get the job done. The Peugeots seem to be quite expensive although their cabins are well equipped and it is a recently introduced model with all the latest safety kit. One snag is the distribution of branches and service points. The Opel Combo has been available for a few years. I have not driven one as they are quite rare and cannot comment on it. It is a little smaller than the Caddy and Doblo. I am quite a fan of the FIAT Doblo. It’s got a roomy well thought out cabin with lots of handy pockets, holders and storage spaces. All the doors open the way they should and the load area is actually quite big. I drove the previous diesel model and found it to be superb with a brilliant air conditioner. I am told the present petrol model is an upgrade. It certainly seems as comfortable and is well appointed but does not come standard with air conditioner. These vans come with all the modern safety equipment and ride enhancement tools fitted. Take one for a test drive. The VW Caddy is an efficient small commercial vehicle. It’s cab is a bit smaller and less well equipped than the Fiat’s but still comfortable and practical. They sell around a hundred a month of them. It reminds one a bit about the Polo of two generations ago. You also get the Caddy Maxi which is 300 mm longer, has a capacity of 800kg and a load volume 4200 litres and costs R183 509. There is also a Maxi crew bus which is a van with a second row of seats at just under R200 000. Safety features include disc brakes front and rear, ABS / TCS / EBC, electronic power steering and rear fog lights. If you want rubber floor covering it will be an extra R1570. Cruise control is R1 700 and air conditioning is R8 400 extra. The side door together with the wide opening rear doors make these vans very efficient business vehicles. Add to that the added security and the comfort of the cabins and they become a real option to the old school bakkie with a canopy. Volkswagen is going from strength to strength with ever better vehicles and seemingly a model for ever need. A glaring omission from their line-up has been a good leisure bakkie, although they have offered the T5 business bakkie for some time. The launch of the Amarok has been much anticipated. had a good look, asked about the motor, thought a bit and then pronounced he would stick with his Isuzu. He did not like the idea of a small 2.0 litre engine powering such a big bakkie. He felt the little engine would be working too hard. And it is a big bakkie. Only the Nissan Navarra and a Ford F250 match it for size. One of the first people to buy one has had quite a saga with his Amarok. After convincing his wife that he really did need it he just could not afford any more domestic drama. On the second day he accidently swiped the left mirror while pulling out of the garage. This he had replaced the same day. Unfortunately a few days later he removed the right mirror rather violently because he was worrying about the other one. Now he parks the Amarok outside. It’s either that or trade it in or widen the garage. Divorce may be an option. On the open road the VW cruises at 120km/h with ease with a light load (in this case camping gear for a weekend). I got 7.6 litres/100km in highway travel at 110km/h. My diesel consumption average was 9.2 litres/100km, which included a lot of town driving. If you need to overtake, change down a gear and you are away. There is more than enough power for normal city and highway use. She is a pleasure to drive on the open road and is very safe because of the electronic stability control. VW says she does 0 -100km/h 11.1 seconds and has a top speed of 181km/h. I did a little jeep track driving, including some steep stoney bits which the Amarok handled with aplomb. All the controls are easy to use and intuitive. The only problem for me was the rather narrow power band. I struggled to keep it in the optimal area. If you are going to tow a boat or heavy trailer you may be better off getting the VW T5 Transporter bakkie which has the magnificent VW/Audi 2.5 TDi engine. If you are going to be driving almost exclusively on tar and good gravel roads you won’t have a problem. If you are going to spend a lot of time on dodgy roads or jeep tracks or go far up into Africa you should perhaps consider something else. 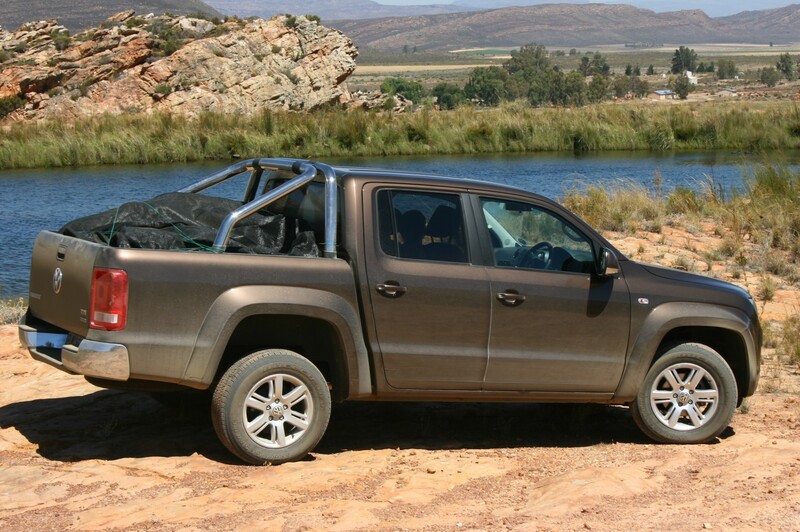 What is there to like about the Amarok? In the first place the cabin is class leading and feels like a car. It’s big, comfortable, well designed and put together in typical Volkswagen style. In short it’s brilliant. It has all the bells and whistles including climate control, cruise control, fully adjustable driver’s seat and steering wheel and a 12V socket on top of the dashboard. The pockets in the doors are even lined with carpeting. Only the Navarra matches it. The load bay is huge, big enough to take a euro pallet. What are the niggles with the Amarok? This is actually a truck, a very big bakkie. It does not fit into all home garages and parking bays and is a bit of a squeeze in some public parking places especially the roof height. Beware the side mirrors. A small niggle is a dash mounted cup holder which stands out into the cab, but it can be unscrewed. The gears take a bit of getting used to and it has that typical VW second gear which just cannot be rushed. After a few days the gears will become second nature. Allied to this is the very narrow power band. It also takes some getting used to. These issues may impinge on its towing abilities. I did not like the idea of the computer being right next to the battery and I thought the slightly cosmetic bash plate must reduce ground clearance by quite a bit. There are only four tie down points and all are on the floor of the loadbay. The two front ones are far in and are very nearly useless. The engine as tested is a bi-turbo 1 968cc diesel producing 120kW@4 000rpm and 400Nm@1 500-2 000rpm with a 6 speed manual gearbox with low range and diff lock at the back. Ground clearance is 249mm. Prices start from R316 800 for the base model 2.0 TDI 90kW 4x2Trendline, R364 400 for the 2.0 TDI 90kW Trendline 4Motion® and R342 400 for the 2.0 BiTDI 120kW 4x2Highline. The Amarok comes with a 3 year or 100 000km warranty, a 5 year or 90 000km maintenance plan (R23,223.00) and has a 15 000km service interval. Welcome to Wheelswrite, the place where it’s all about wheels, cars, bakkies. You will mainly get reviews of cars, bakkies, suv’s and mpv’s. General automotive news items will also make there appearance. Let me know what you want.